Aaron is gonna hurt some feelings with this one. My opinion, where the Glock 43 makes the most sense is when carrying in non-permissive environments. 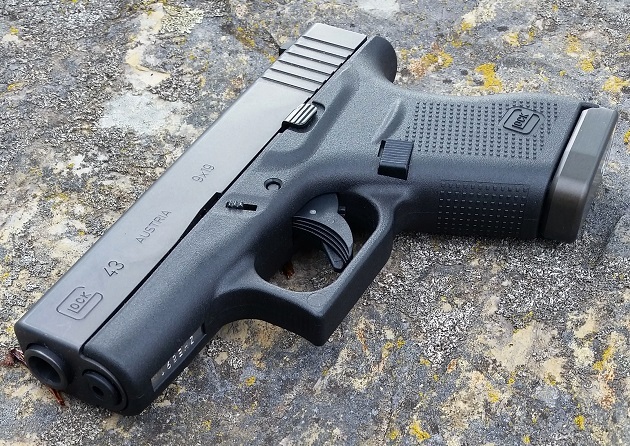 If absolute concealment is vital, for whatever reason, then the Glock 43 is a better choice over the Glock 26 in some cases and for some people. And Speedo carry. Because it’s hard to conceal a double stack wearing a Speedo. Haha ….shorts and a t shirt work just fine for my G30! I feel bad for the guys that can conceal a double stack in their speedo. Congratulations. You just won the internet with that comment. I think some people will get upset by it, but it’s all about context. If I am going to the beach (live on the water) or riding the beach cruiser it might make sense to tuck that with a trigger guard holster like a RCS vanguard. I carry a 19 a majority of the time and it’s not an issue, so long as I wear clothes that accept a belt. Can’t rock board shorts with a 19. Now, maybe a 26 could work too who knows? But at the end of the day I’d rather have a gun of 6 or 7 rounds than no gun at all. Aaron and Brandon nailed it – it’s a good gun, but it’s still a LOW capacity weapon. Use when appropriate, which hopefully is limited. I like small guns, always have. That said, are they suitable for what I want to accomplish for concealed carry? 99% of the time, no. Why? Lack of magazine capacity. If I can discreetly conceal a gun, I want a gun with the best caliber/capacity possible for concealment. I want to accomplish winning. I want to accomplish cutting out variables. Running out of ammuntion is a negative outcome that is easily avoided. I generally carry the G26 with a +2 extension for a total of 13rds, with a 15rd mag reload, or a G19 with a G17 +2 extension for a total of 19rds reload. I love the G42. Shoots great. I just don’t see myself carrying it unless I have no choice to carry something else. I feel more so about the G43. Where does it fit in my carry collection? I just am not certain. I own the quintessential CCW gun the G26, and the G19. What can the G43 do that the others cannot? And there in lies the rub. Not that I have had my hands on the G43. None have hit this area. I’m a Glock fanboy and carry a G19 everyday. When will I carry a G43? When weight is a concern. When I run, or am wearing workout pants/shorts and still want to carry. NPE where you need deep concealment and a doublestack is just too fat. But then there’s better options than the 43 for that. I agree with pretty much everything Aaron said. However, I work in an NPE so I need to be super discrete. I have a Walther PPS for this purpose and it works very well. Sure, I would like to tote my G19 but it is a chore to conceal it on my thin frame in dress attire. I’m sure the G43 would fit the bill for this too. But don’t get me wrong…more ammo is more better, more smarter if you can fit it in.